Chelsie: The Four Seasons Hotel: London at Park Lane is a stunning five star hotel surrounded by the lush greenery of Hyde park in the heart of Mayfair. The fundamental principles behind all Four Seasons Hotels is continual innovation, remarkable expansion and a single-minded dedicate to the highest standards. The Four Seasons: Park Lane hotel is no exception to this mindset having undergone a two-year refurbishment programme. This programme has seen the bedrooms reconfigured making them even more spacious then before, all public areas have been given a new zeal of life alongside a rooftop extension added to house the new state of the art spa facilities. We were particularly keen to try The Four Seasons afternoon tea served in the Amaranto Lounge. 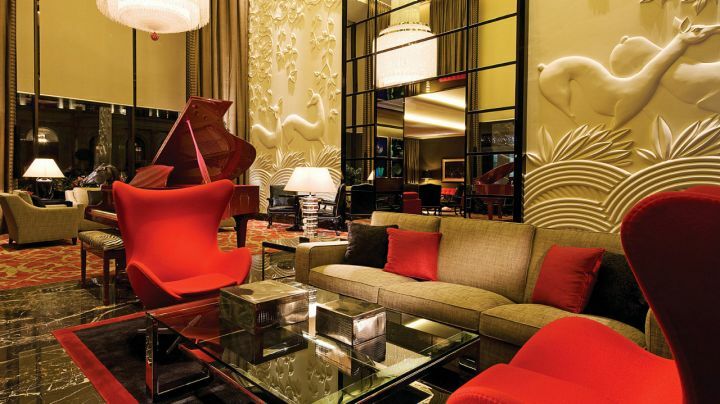 The Amaranto Lounge, has been designed by Pierre-Yves Rochon who is responsible for Four Seasons projects in cities including Paris, Florence, Geneva and Washington DC. The decor of the room includes dark French marble, classic timbers and rich red upholsteries making this a beautiful setting for a spot of afternoon tea. Confirming the hotel's single-minded dedication to the highest standards; The Four Seasons has recently been presented by the critically acclaimed Tea Guild an award of excellence. This award is in recognition of their outstanding quality and consistently high standards in afternoon tea service. 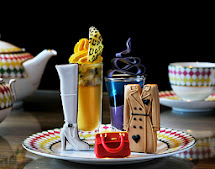 The afternoon tea available at The Four Seasons is an unprecedented combination of extensive choice and attention to the detail. Guests are able to select from the following afternoon tea options: 'La Dolce Vita' which is The Four Seasons signature afternoon tea incorporating the very essence of delicious Italian cuisine. 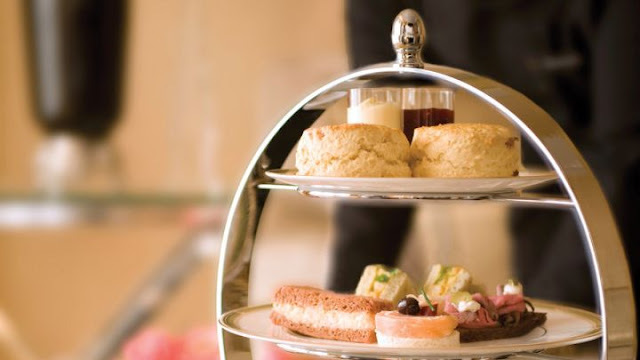 The 'English Afternoon Tea' which as to be expected is quintessentially English, the 'Vegetarian Afternoon Tea' and finally a 'Cream Tea' which is a lighter alternative to a full afternoon tea. Kate: From the moment we approached The Four Seasons front doors, we were greeted with kindness and exceptional service. 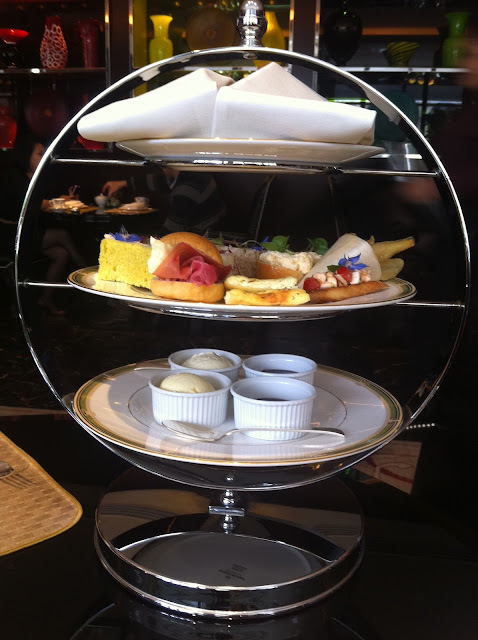 We were guided through the front lobby to the Amaranto Lounge for our afternoon tea fix. Our table was immaculately presented, with beautiful flower adorned tableware, and tea accessories including a tea timer used for perfecting the brewing time and a strainer. As we sat in the big deep black chairs, accompanied by a plump pillow for our backs I felt overwhelmed with excitement for what the afternoon tea would entail! Our waitress Ermelinda talked Chelsie and I through the different afternoon teas available, offering expertise and insight throughout. Undeniably, the extensive range of choice available made selection a little tricky. After much deliberation I selected 'La Dolce Vita' and Chelsie selected 'The English Afternoon Tea' both accompanied with a flute of Louis Roederer Champagne. As we sat in our chairs, admiring our surroundings our attention was turned to the beautiful music being played live by the Four Seasons pianist. Ermelinda, informed us that the pianists would play for the entire afternoon tea seatings and in total there are four different pianists. At The Four Seasons tea selection is a subject of great importance, with a great deal of knowledge and interaction involved. The tea menu is extremely comprehensive with dedicated categories including: vintage and unique blends, bespoke Amaranto blends, teas, hot chocolates and coffees. Ermelinda returned to our table with a wooden box filled with different see through bottles containing numerous teas on the menu. Chelsie and I were encouraged to open the different bottles, and become acquainted with the different teas as we were provided with insight into the different tastes, qualities and background. I had a lot of fun selecting my tea in this manner, and picked the Mango Oolong tea which is both refreshing and sweet, with a scent of ripe mangos. A special mention must go to Chelsie's selection. Chelsie's tea was selected from the vintage and unique list, and is called 22ct Gold Tchaba Rose. This tea has a light delicate perfume, with a soothing, refreshing taste; the best part? The high grade white tea is infused with 22 carat gold leaves and rose petals which glitters like pixie dust in the sunlight. In line with our personal preference we elected to enjoy our teas with our desserts. Chelsie: Our afternoon tea arrived on a modern circular stand, and because Kate and I had selected two different teas each tier was an infusion of both. The top tier contained warm traditional, golden raisin and cranberry scones from the English afternoon tea and for the Italian tea sweet brioche filled with Apricot Jam. The thick clotted cream and homemade strawberry jam for the English scones were neatly presented on the bottom tier. The middle tier was beautifully presented with The Four Seasons's chiefs personal signature; fresh flowers scattered across our savouries. The tier contained the following sandwiches for the English tea: Organic free range egg and watercress in a brioche roll, tea smoked salmon with lemon and black pepper mayonnaise on caraway seed bread, cucumber and truffle cream cheese on raisin and vanilla bread, salt beef, pickle and English mustard mayonnaise on brown bread and roast chicken with sage mayonnaise on Rosemary bread. The Italian selection consisted of: tomato mozzarella and basil bruschetta, focaccia al formaggio, bottoncini with Parma ham and robiola and vegetarian fritto mist. The food was captivating, with intense freshness and flavour in each item. I really liked how the traditional favourites in the English afternoon tea were given an innovative twist through the different ingredients used; this was most evident with the smoked salmon sandwich. As we talked and enjoyed our food, Ermelinda's service was expectional. Ermelinda was always within close proximity to assist us with any questions we had, to offer additional refills or even to provide us with clean plates when we moved on to our scones. On completion of the savouries, our eyes lit up when Ermelinda returned with our delicious looking desserts and our choice of teas. Desserts for the Italian tea included: Cannolo Sicilliano, torta caprese, cannoncio cream and pistachios, bigne San Giuseppe with candied cherries and soft torrone. The English desserts consisted of: lemon meringue pie, seasonal fruit tartlets, caramelised blueberry cheese cake, white chocolate and rhubarb compote pannacotta and gianduia cream eclair. Kate and I fell in love with the entire collection, we are unable to name a favourite but trust us The Four Seasons is undeniably our favourite location for desserts! This truly was the perfect finishing touch for our afternoon tea, and I honestly enjoyed every minute of the experience. Kate and I cannot recommend this afternoon tea enough! This afternoon tea has the complete package, a fantastic location, exceptional food, an extensive range of tea choices and highly attentive service. Afternoon tea at The Four Seasons will be an unforgettable experience regardless of the season, and is perfect for a birthday treat, anniversary, baby shower or just because you deserve a little indulgence! Really enjoyed that review...visual salivation notwithstanding!